Topic: Las Vegas Car Stars Returns May 17-19. Re: Las Vegas Car Stars Returns May 17-19. Las Vegas Car Stars Returns May 17-19. Hey JP, that's nice! I would like to get one like that to along with my KITT replica. Any idea if he has more? This is a great show to go to! We travel from Chicago to Vegas every year to this show with our KITT. Great Time, Great Show! Don't miss it!!! Topic: Las Vegas Car Stars May 14-16 2015 Who's Going? 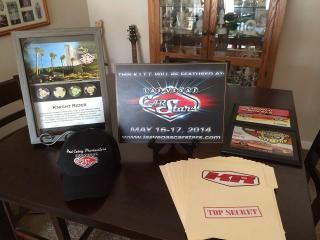 Re: Las Vegas Car Stars May 14-16 2015 Who's Going? WOW, no reply's........ This place must be dead now......its kind of sad cause this was the place to be before everyone went to Facebook. Las Vegas Car Stars May 14-16 2015 Who's Going? We are excited to once again be a part of this great show. We will be there again with KITT! Can't wait to hit the road and on our way! So, who's all going? 3 weeks to go till LVCS Show 2015!!!!! Well i like the mustang and i like it as kitt and that's all that matters to me. I agree! I don't care what others think of my car, I didn't buy it and turn it into KITT to please others. I can do the same with my scanner, but then it wouldn't be the correct KITT. I don't understand all the hate on the Mustang KITT. People just need to learn to live with it. What is the price for the plate? I have your frame on my 09 KITT and love it! Re: Great News for KITT Mustang Replica Builders! No, I don't have mine anymore. I did just have two tires mounted and had no problem. It depends on who you have mount them and what type of tire machine they have. If they lube up the tire and rim good, it will go on with no problem. Counting down the days till LVCS 2014!!! Can't wait!!! It will be a great time!!!!!!! My KITT will be at the show this weekend in Rosemont, IL at World Of Wheels. I will post some pictures during the weekend.